RV Kitchen: Is this THE toaster for RVers? Is this THE toaster for RVers? Is it just kitsch, or is there a practical side? 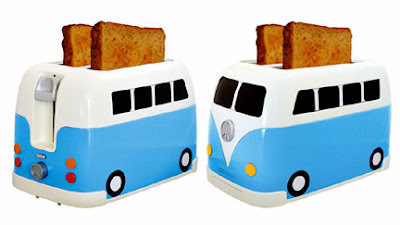 RVers, like everyone else, love their toast. For all others, follow closely this post. Yes, we're here to tell you that the cutest thing to cook sliced bread in has arrived. You too, can have your very own, Volkswagen Camper Van Toaster. Some years back, VW ran a special promotion in Japan, selling there – and in limited numbers – a toaster styled after the venerable hippy van. Finding those relics today costs you a small fortune – recently eBay has them listed at nearly $500. But if you're in the pounds (or Euros) a new VW toaster is already in "pre-sale," with an asking price of a mere 35 British pounds, or about $57 plus shipping. While these don't appear to emblazon the completed toast with the official VW logo, they are still – face it – cute. For us on 'this side of the pond,' there could be a problem. While you can order the toaster with your choice of a UK or European wall plug, the little counter cuties do require 220 volts, not the usual standard here in the U.S. Nevertheless, for $60 where else are you going to by such a kitchen counter conversation piece? Still interested? Check out this European retailer.